Iran protests, March 1-8, 2019 reached almost 300. This statistic on one hand, represents an absolute popular discontent, and on the other hand, demonstrates the regime’s inability to solve the problems of the people. The people articulate in their protests that the government is oppressive, incompetent and incapable of solving any problems. Also, the slogan: “O, Hojjat Ibn al-Hassan (the Savior), uproot the oppression”, represents a fundamental desire for toppling the regime in its entirety. It is noteworthy that the Iran protests, March 1-8, 2019 is in congruence with the great rallies of the supporters of the NCRI in Europe and the U.S., as well as the activities of the resistance units, the PMOI/MEK’s network, inside Iran. On average, there were 43 protests a day. A group of woman workers of Dasht Naz Co. staged gatherings in Sary (N.) to protest the lack of job security. Railway workers in cities of Andimeshk, Nishapur, Sirjan, Bandar Abbas, Tabriz, Khorramabad, Mashhad, Marand, and Ajabshir held a gathering and went on strike to protest their unpaid wages. The municipal workers in the cities of Mehran, Veys, Ahvaz, and Rasht held gatherings and went on strike to protest their unpaid wages and not receiving their bonuses. The workers of Tabriz ball bearings manufacturing factory staged a two-day protest gathering when the officials could not meet their demands. The workers of Chamshir dam in Gachsaran, Kohgiluyeh and Boyer-Ahmad Province, staged a gathering to protest unpaid wages. The workers of Phase 14 Kangan, South Pars, stopped working and gathered in protest against non-fulfillment of their demands. The workers of the Pars Special Economic Energy Zone in Asaluyeh, Bushehr Province, held a gathering to protest about layoffs and unpaid wages for seven months. During Iran protests, March 1-8, plundered customers of Caspian Credit institute, in Tehran, Padideh Shandiz in Mashhad, Shadi jewelry store in Tehran, Samen alhojaj in Tehran, and Parsian in Tehran staged protest gatherings. The retirees of Khuzestan Steel Co. held a gathering to protest against their unpaid pensions, their unpaid New Year bonus, and nonpayment of their past years fees and dues. The retirees of Isfahan Steel Co. held a gathering to protest against unpaid wages, the New Year bonus, and non-fulfillment demands of previous years. They blocked the streets that led to Darvazeh Dolat district. In Iran protests, March 1-8, we witnessed the third round of nationwide strikes and sit-ins by the retirees and working educators that continued for three days. -The educators in cities of Mashhad, Kermanshah, Ardebil, Shiraz, and Orumiyeh held gatherings in front of the province’s General Office of Education in protest against the officials’ failure to meet their demands. The students of Agriculture department of Karaj Univeristy staged a protest gathering at the campus, when the head of the department prevented them from holding a protest meeting. When the Rural Cooperative, a body affiliated with the regime, wanted to interfere in the election of Farmer’s Guild Association in Shadegan City (S.W. ), the farmers gathered in protest in front of the province’s governorate in Ahvaz. Mobile marketers in cities of Isfahan, Tabriz, Ahvaz and Allaedin Bazaar in Tehran, stopped working and went on strike to protest the high prices and the fluctuation of mobiles’ price. Marketers in Khorramabad (W.) stopped working and went on strike to protest the high prices and market depression. – On the eve of Rouhani’s visit to Gilan Province, people tore down his posters in several cities, including Lahijan. – When Rouhani’s vehicle was crossing a street in Lahijan to take him to a meeting, a protestor jumped in front of the car to stop it. Rouhani’s bodyguards pushed him aside. At the same time, other protesters chanted: “Death to Rouhani”. 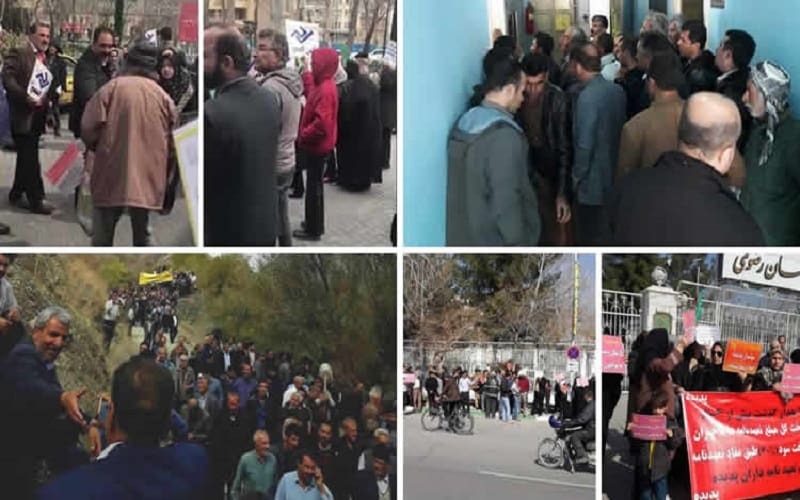 – The employees of the Saham-e-Edalat offices, who had come from different provinces to Tehran, staged gatherings for three Consecutive days in protest to the lack of job security and overdue salaries. – The employees of Khomeini Hospital in Karaj City staged gatherings for several days in protest to overdue salaries. As the economy collapses, the mullahs are unable to solve people’s problems and thus more sectors of the society, particularly laborers and educators will face poverty. Given the growing number of the protests in the first week of March, it can be concluded that the clerical regime will have a difficult year ahead and has to face a nation that rejects it in its entirety.